Today’s guest post on Fragile X Syndrome comes from Happily SLP, Carly Fowler. Today’s guest post on genetic syndromes comes from Rebecca Freeh Thornburg, who is contributing information on the Apert Syndrome. Rebecca is a repeated guest blog contributor. Her informative guest post on the CHARGE Syndrome can be found HERE. Today’s guest post on Monosomy 13q Syndrome is brought to you by the ever talented Maria Del Duca, M.S. CCC-SLP of Communication Station: Speech Therapy, PLLC, located in southern Arizona. Today’s guest post on Williams Syndrome comes from Pamela Mandell, M.S. CCC-SLP with a contribution from Priya Deonarain, MA, OTR/L, CKTP. Today’s guest post on genetic syndromes comes from Rebecca Freeh Thornburg, who is contributing on CHARGE Syndrome. Today’s guest post on genetic syndromes comes from Kelly Hungaski, who is contributing an informative piece on the Hurler Syndrome. November is Menkes Awareness month, so today Olga Z. Porterfield will be contributing a post on the Menkes Syndrome. 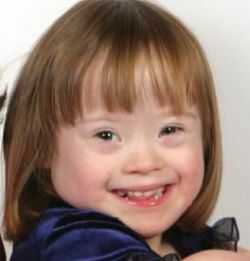 Today’s guest post on genetic syndromes comes from Rachel Nortz, who is contributing a post on the Down Syndrome.